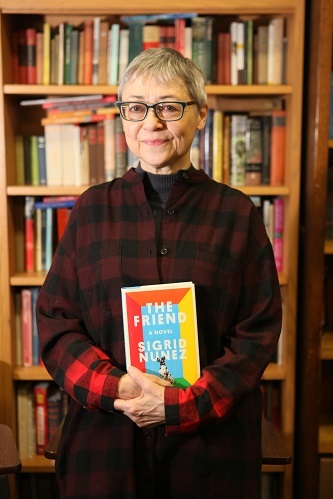 Adjunct Professor Sigrid Nunez's National Book Award–winning novel The Friend explores the life of a woman suffering after the loss of her best friend and mentor, and burdened with caring for the unwanted dog he left behind. Photo by David Rozenblyum '07. Sigrid Nunez, an adjunct professor in the Brooklyn College M.F.A. Fiction Program, won the National Book Award for her novel The Friend last evening at a ceremony at New York's Cipriani Wall Street. The award judges called the novel an "exquisitely written and deeply humane exploration of grief, literature, and memory." "I was very surprised to make it onto the long list and then the short list," says Nunez, still reeling from having actually won the award. "I'm very grateful." Nunez began instructing in the college's M.F.A. Fiction Program in fall 2014. "I enjoyed teaching my first class so much because the students were excellent," Nunez shares. "So when I was asked to continue teaching at the college, I was very eager to do so. My experiences with Brooklyn College students have been wonderful. They are truly talented." The program in which Nunez teaches is one of the most competitive and revered in the nation, attracting and producing a host of acclaimed writers. "Nunez is a brilliant writer and an important figure in the literary world," says Joshua Henkin, award-winning author, professor, and coordinator of the M.F.A. Fiction Program. "She teaches the reading seminar to our first-year M.F.A. fiction students, and she engages and challenges them in all the right ways. We are extremely fortunate to have her on our faculty." Born to and reared in New York by Chinese-Panamanian and German parents, Sigrid Nunez has published six novels, including A Feather on the Breath of God, The Last of Her Kind, and Salvation City. She is also the author of Sempre Susan: A Memoir of Susan Sontag. In addition to her recent National Book Award win, Nunez is the recipient of four Pushcart Prizes, a Whiting Writer's Award, a Berlin Prize Fellowship, and two awards from the American Academy of Arts and Letters: the Rosenthal Foundation Award and the Rome Prize in Literature. Sigrid Nunez's website contains more details about her work. More information about the Brooklyn College M.F.A. Fiction Program is available on the program's website. Brooklyn College is able to provide its students with the most exceptional faculty experts to help them hone their artistic skill thanks in part to the generosity of alumni and friends received through the Brooklyn College Foundation. Learn about the various ways to contribute to student success through the foundation.